Since I am a teenager, I always dreamed of building a harley custom bike from the ground up. Never did it for all kind of reasons, time, money, other priorities and so on. Last year, I have been diagnosed with Kidney cancer and had to have my kidney removed. The night before the surgery, I decide that I would "build my dream" if I would survive the surgery. 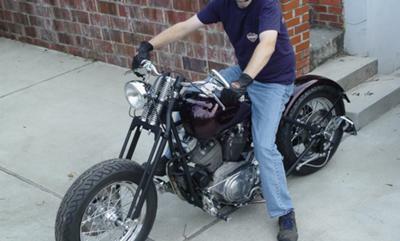 I bought a wrecked Sportster 1200 1993 as a donor bike and put the engine on a new frame, wheels, front end and so on. The name of the bike is "Joie de vivre" which means joy of life in French. Very appropriate. I still have some work to do on it but the bike is complete about 90%. The picture above is my first ride on the bike. It is far from being a professional built bike as it is my first build. Dude that thing is AWESOME.Way to put a PICTURE of the mind & make it BREATHE Dr. Frankenstein. Yeah,it is a stout scoot and I like the tire combo.I don't like the skinnies as well as the fat look.Good choices on the build and it works well on the eyes. AS MY TITLE SAY, CELEBRATE YOUR NEW LIFE RIDING EASY. I WISH I COULD DO THE SAME. LIKE YOU, I'VE ALWAYS DREAM OF BUILDING MY 1ST BIKE BUT FOR SAME REASONS I JUST CAN'T START IT. YOU INSPIRE ME. HOPEFULLY, MY NEXT BLOG WILL BE MY WITH MY OWN 1ST BUILT. Not bad next you should try building a car or a boat! I Really Dig the look of your bike !!! Nice Look !!! For your first bike this is Excellent !!! Nice Detail. You should be Proud of yourself for going through with it. Now that you've built your dream...make sure that you ride the hell out of it and enjoy it to the fullest !!! Congrats!!! Congratulations dude, long life riding your dream!! Like many have stated Son, you're first attempt is an awesome result in what our culture is all about. From looking at your submitted pic, it appears that you're a pro! First shot? Hummm......I hope that mine turns out as bitchin' as yours has when I'm done. awesome bike, and I know you will do it great with your project of life as well so aime la vie !!!! Nicely done. Enjoy the ride, look forward to seeing your next creation. Live life to the fullest. NICE FONT END,PUT IT ON UTUBE WITH SOUND! I couldn't take the hard-tail though! Pretty good bike kid, I am inspired to finish my Triumph. I have another bike to ride and have not had the need to break my old back on a hardtail again, so I have been putting off the "rebuild" I started when you where probably in 3rd grade. I love to see a new generation find their own styles. Keep it up and we will see in the Chopper Rags one of these days. "Live long hard and go rough"
you've got talent kid, live the dream keep on building! D.C.Peery builder of the lowdown & blue bike.